There has always been a lurking doubt in the mind of today’s youth whether Gandhi Ji’s philosophy of Ahimsha (non violence), Satyagriha, Anshan (fasting) is relevant. But Anna Hazare’s movement against corruption has proved its relevance even today. This movement has proved that Gandhi’s philosophy is still relevant in modern times. In addition to his philosophy of Ashimsa, Gandhi ji had a vision of an ideal society along with its own political and economic prescriptions. Youth of today has always raised a question whether India should go through this route and if so, how to achieve the vision which Gandhi Ji perceived. People have criticised very often his vision and philosophy variously. These critics have blamed Gandhi ji as conservative and out dated in modern times and his puritanical approach was no longer helpful in development of the country. But Anna Hazare has proved and silenced all critics by giving a message worldwide that Gandhi Ji’s political approach, his satyagriha, Ashimsa, fasting is still relevant for a happy and peaceful society. Anna Hazare by his 12 days fasting has proved the theory of Gandhi Ji that it is superiority of soul that cannot be potholed by any group of tyrants in a political system. Gandhi Ji propounded that putting the soul pitting against the powerful ones leads to achieve the target and this pitting results in a massive public movement what we read in the history of our independence and now we see happening again in India. Really this is the mantra of Gandhi Ji which Anna Hazare has espoused not only to fight against the entire political system but also has successfully awaked the people of India to fight collectively against the virus of corruption in a very peaceful and non violent manner. Like Gandhi Ji, Anna Hazare has also envisaged an equal and egalitarian society and he boldly declared amidst lacs of people on Ram Lila ground today that he believed in decentralisation of power. Hazare declared that it is the centralisation of power which is the root cause of corruption. Hazare believed in village based economy and political system which would certainly eradicate corruption from top to bottom. Anna Hazare has astonished the entire world by showing power of idealism and spirituality and their relevance in progress of a society with values. It seems that it is for the first time after Gandhi Ji that Hazare has succeeded in raising his voice in a Gandhian Way. It is the victory of our people who have supported him fully throughout India and abroad. It is symbolic that people too believe in the power of soul and want to live in a world of peace and harmony if people like Anna Hazare leads humanity. Today is historical and would always be remembered in golden words in Indian History. Though our parliament has agreed unanimously to adopt many of the provisions of Jan Lok Pal Bill as proposed by Anna Hazare, but the important question is that people of India rising above all other things have stamped a mandate that they want a peaceful secular society which would be corruption free. Some people have raised a question that it would lead to conflict between the parliament and the people. 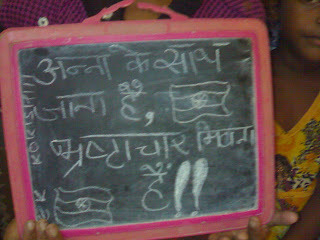 But they are wrong in their thought due to the reason that Anna Hazare and his uncountable supporters throughout India and abroad who participated in this mass movement against corruption were just conveying their message and sentiments to the parliament where elected representatives of the people were sitting and watching silently this virus of corruption ruining the people. Nowhere in the entire movement it was evident that people were challenging the duly elected Government and the Parliament. 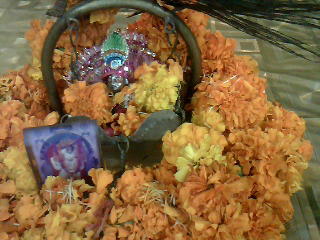 Today is Janamastami i.e. 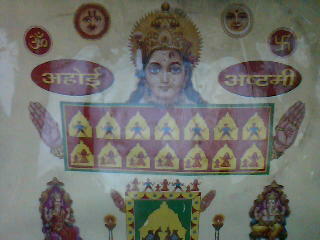 Birth of Lord Krishna. People in India celebrate this festival with great enthusiasm. 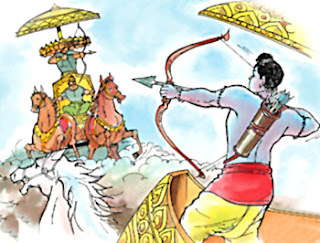 Ø Many people keep a fast on this day, usually a waterless fast until the birth of Lord Krishna at mid night. Ø They spend the day immersed in Lord Krishna's glory by reading, reciting and singing HIs divine leela (incidents of life during his incarnation on the earth) especially in the evening in the temples. Temples are decorated beautifully and people visit temples to offer their prayers. 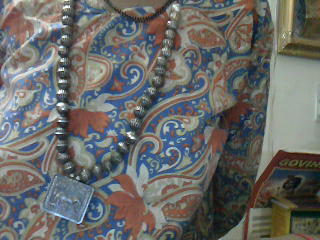 Ø At midnight, the Lord Krishna’s birth hour, a prayer is performed. He is also installed in the form of a child ( in hindi – Laddo Gopal) in a decorated cradle and devotees pay their prayers and offer sumptuous dishes especially 'Makhan' (butter) and Mishri (crystal sugar) as Lord Krishna loved this in His childhood which may be seen in may of His pictures with Makhan and Mishri. This festival is celebrated totally with a devotional feeling towards God having Him in the form of an Infant which means Almighty is not away from human beings at any time. He is delicate like a newly born child.... to get Him, human beings just have to have self realisation and pure heart like God Himself. In addition to above, in many cities like Mumbai, people take part with great enthusiasm in a game which is called ‘bursting of dashi handi’. In this game, an earthen pot full of curd and butter is hanged high on a rope and children and young boys try to break by making human pyramids. 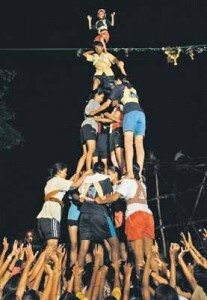 There are competitions and prizes on these events and this year the highest dahi handi is prized for 10 million. This bursting of dahi handi symbolically means exposure and eradication of evil. This festival is also symbol of harmony and equality in the society and people celebrate this festival with great brotherhood. Anna Hazare’s anti corruption movement is in full swing in India to make India corruption free. Anna has boldly declared that it is an other freedom struggle but now it is against corrupt people of our own society to make the common people free from their shackles. Corruption is immaterial for the rich and ruling class as they can afford any thing whether inflation or anything else. But what about the lower and middle class of people that form more than 90% of Indian population. It is this class of people which is badly hit by corruption. Each and every government department from top to bottom is found to be corrupt practically realised by each and every citizen of India. The common man is put to lot of hardships and it has become difficult to make both ends meet as prices of essential commodities are rising constantly due to corruption. Anna believes that our freedom which we got at the cost of sacrifices of lacs of people of this country is at stake due to corruption and unless it is uprooted, the country will not be free in its true sense. Therefore, a peaceful war has been started against corruption with the help of immense support from people. But the question arises why this movement is being opposed by the ruling party and their supporters? The ruling class boldly declares that Anna Hazare’s anti corruption movement is unconstitutional and un-parliamentary which cannot be accepted in a democratic set up like India. But why this ruling party forgets that the very first word of the Preamble of our Constitution i.e. “We, the people of India...” makes is abundantly clear that Constitution is not separate from the people who have sworn it. Parliament is nothing but a house of representatives of the people. Then how can this movement of people throughout the country be blemished as un-parliamentary or unconstitutional? It is very strange in the Indian democracy that the ruling party is ruling over the country having only 15-20% votes in their favour and opposing this mass movement of people in India. If a person thinks rationally it is evident in India that 90% people (may be 95%) belong to lower and middle class and these people are badly hit by corruption. Rich and ruling class can afford corruption in any situation. Rather this rich and ruling class prospers only due to these bacteria of corruption. Who does not know the names of various big corrupt poliotician, ministers, officers etc who are under trial but nothing is happening. It is a common phenomenon in India that some people adopt corrupt practices and amass uncountable wealth. In turn wealth brings them power. And with this power and wealth, these corrupt people govern over the country keeping the lower and middle class at back foot. Jan Lok Pal Act is nothing but a sort of deterrent over the people who are in the government in any position i.e. politicians, ministers, officers, judges etc. If a person performs his duty in duty bound manner, there should not be any fear of any deterrent. Tough Opposition by the ruling party against this anti corruption movement is indicative of malafide intentions of the corrupt people in the government. Why not deterrents should be there in the democracy? How many examples can one quote regarding punishment of corrupt people who have been awarded severe punishment by Indian Courts? How many examples one can quote about confiscation of this immense wealth of a single corrupt person? Name any politician who have made efforts or raised voice against the thousand lacs crores rupees black money in swiss banks? Whose money is this? How many people know about it? From where was this black money earned by these corrupt people? They have sucked the blood of this poor and middle class of India and when someone like Baba Ram Dev raised the voice, how the innocent public was thrashed by police in the name of law and order in the midnight. Just think who were the people who ordered the police to fire tear gas shells and lathi charge over the sleeping people taking part in the movement? Is this Indian democracy which provides everyone fundamental rights enunciated in the constitution? Just think, if the people like Anna Hazare have started to view a better tomorrow for common man with no corruption in India, What is wrong? What was Gandhi Ji doing for our independence? What was his motive? Isn’t Anna has the same motive, of course this is a fight against corruption which has become rampant in all spheres of our society. 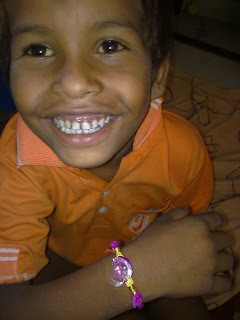 Really in Anna Hazare, people of India see emergence of another Gandhi to fight against the virus of corruption. 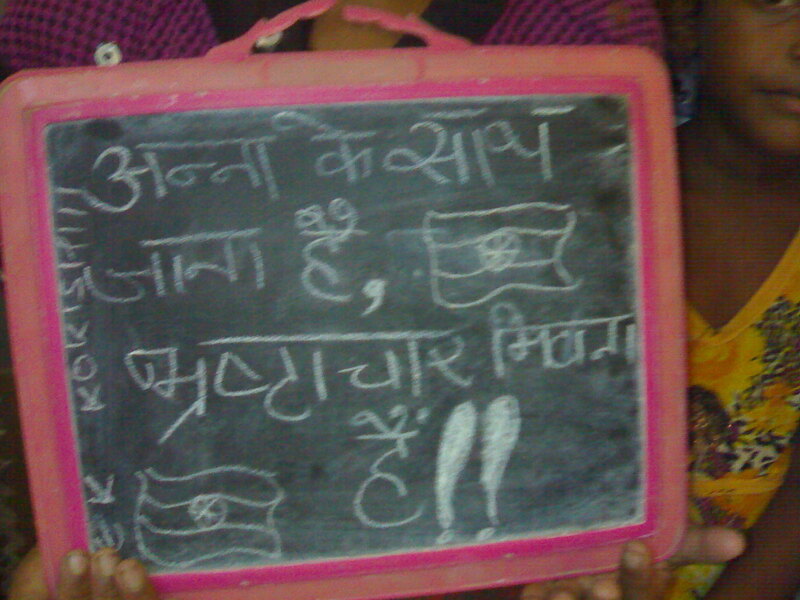 Anna Hazare’s movement is purely based on non violence like Gandhi Ji’s movements for our freedom struggle. 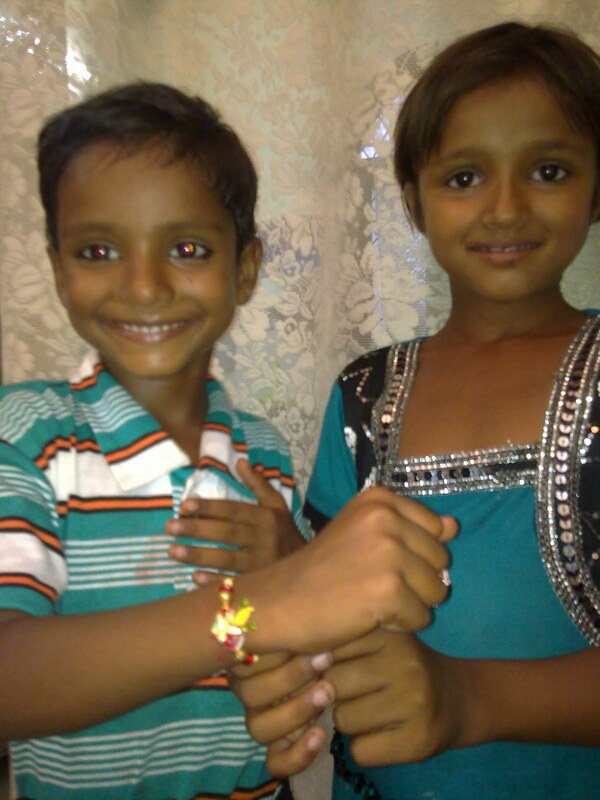 Ek Koshish, One Attempt: Celebrating Raksha Bandhan with Children at Ek Kos...: "Raksha Bandhan (Raksha means protection and Bandhan means bond) is the name of a festival which is celebrated across the country irresp..."
Let's celebrate this INDEPENDENCE DAY with a vow to make India 'INDEPENDENT from CORRUPTION. Let's Join Hands to Raise Voice Against Corruption. Let Your Simmering Feelings and Thoughts against Corruption have a Vent. Classes of children are continuously running at ours. 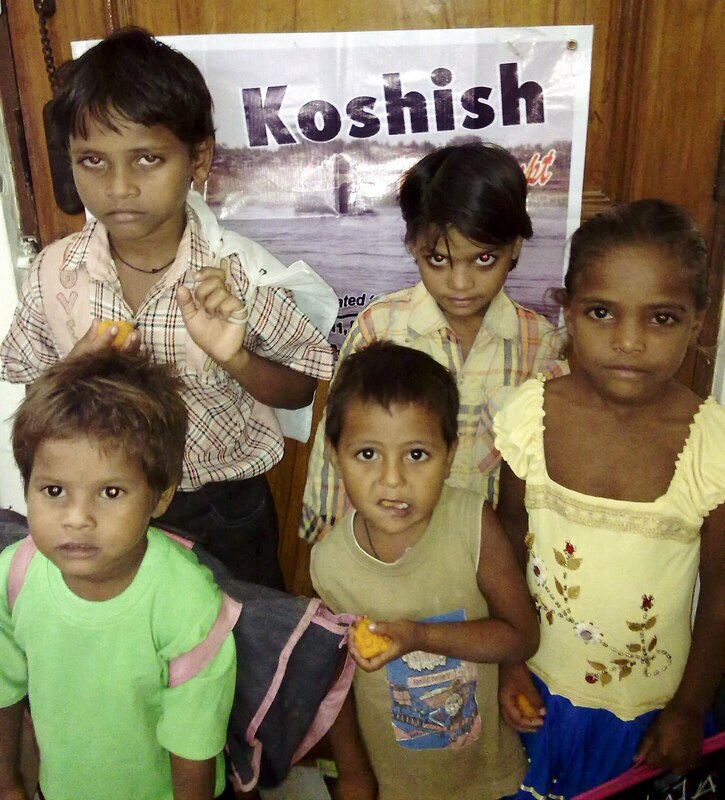 This week, a new batch of five more children namely Mangal (10 Years), Kiran (8 Year girl), Jatin (5 Years), Bina (7 Year girl) and Priya (9 year girl) has started at Ek Koshish. All children are very happy and pay attention on whatever is taught to them. 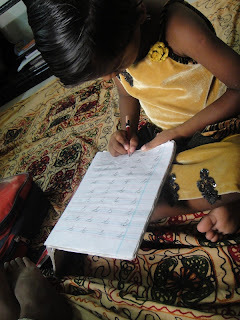 Mangal and Bina seem to be very brilliant students and within a period of 4-5 days, they have learnt counting from 0-9 and some of the alphabets. They did not have any school background nor have their parents any education. They belong to the poorest strata of human society. Priya is also intelligent girl having a little school background. She has a great potential to learn. Seeing these children, one may realise that God does not craft any discrimination while sending souls on earth. It is the society where shackles of rich and poor exist due to human greed and selfish ends, and opportunities are availed by human beings only on this pattern of society based on richness and selfishness. 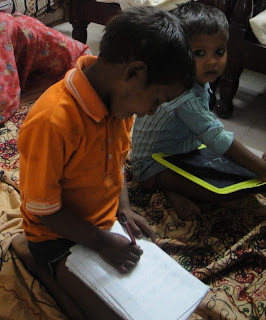 We pray God that we may go ahead in our attempts to educate these underprivileged children. We will be rewarded enough if every one of capable ones could do Ek Koshish (one attempt) to provide them education in their becoming good citizens and a future voice of our country as well as the whole world. We also express our sincere thanks to the people contributing with their time and funds in our attempts to take this noble venture ahead. We are pained at the sudden heavenly demise of grandmother of Mr Justin, our volunteer from USA, and due to which he had to rush back home in USA. Entire family of Ek Koshis One Attempt extend its sincere sympathies with Mr Justin at this crucial time and pray God to bless the departed soul in heaven! We also pray God to bestow courage and patience to Mr Justin and his family to bear this great loss. I want to talk about my experience as a volunteer in India with Ek Koshish, One Attempt. Being here has been one of the most memorable and wonderful experiences in my life: Not only am I volunteering, giving back to the desperately needy community here in Faridabad, but I am also learning so much about Indian culture and Hinduism. Working as a volunteer has been an incredible way to learn and improve my Hindi; should anyone be interested in learning this beautiful language, I can guarantee that working with "Ek Koshish, One Attempt" would undoubtedly accelerate anyone's understanding of Hindi or even Indian traditions. The Ek Koshish team is superb, as they truly care about the projects they run and the people to whom they reach out. For example, this picture, taken during yesterday's lesson, depicts the many kindnesses of the people who run this NGO: The clothes that our student Vicky is wearing, were recently donated to him by the Ek Koshish staff, because he lacked proper clothing. The team at Ek Koshish also purchased all of their school supplies, donated all of their time to tutoring this student and his family and neighbors, and even offered their own home as a classroom for yesterday's lesson: Because of the unbearable heat, the head of Ek Koshish insisted that the children study in his home comfortably, with the luxury of air conditioning. When I was overhearing other locals' reactions to our work here, they had very negative feedback about inviting such children into one's home. 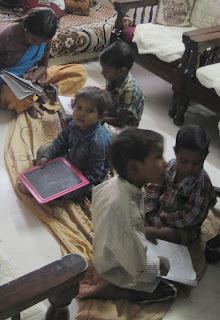 I suppose they don't mind these children coming to work in their houses, but they cannot consider the children enjoying a birthday party or learning to read and write in their own homes. At least it's nice to see that the people who run Ek Koshish's NGO do not have this attitude, not even in the slightest! As a final note, I want to emphasize that volunteering with Ek Koshish is essentially a free trip to India with volunteering arrangements ready for anyone. Of course, there is a very minimal fee for housing, but this is not incumbent upon anyone: If you want to just come and visit Ek Koshish for a day, you are more than welcome to do so; if you know anyone living in Faridabad, you can stay with them and volunteer for free. Otherwise, the very minimal living expenses here in India would be around $150 USD for one month of room and board, use of utilities, and three meals daily, all included. Though funds are very tight with Ek Koshish, they do not have any interest in charging volunteers to work and help the community. I highly recommend this experience, not only to those readers out there who are my friends and family, but to anyone interested in this sincerely altruistic cause! Yesterday, we held our "Ek Koshish, One Attempt" classes with our students from slum areas of Delhi NCR in Faridabad again! 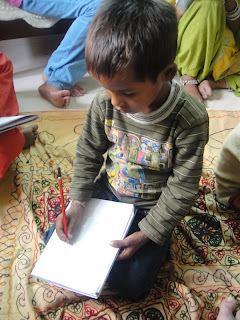 Yesterday, Vicky (about 4+ years old), the oldest of our male students, practiced using a pencil for the first time! I reviewed with him writing the numbers 1, 2, and 3, while he recited their names each time while writing them. The first time I asked him to recite the names of the numbers, he didn't understand the point of the exercise; however, he is very bright, and soon understood how it would reinforce him to learn it appropriately. He then performed the exercise properly for the rest of the lesson! We also started our first letter, the letter "A," which you can observe in the picture! It was difficult for him to grasp the pencil correctly at first, because it was such an alien concept to him; but, he soon got the hang of it. 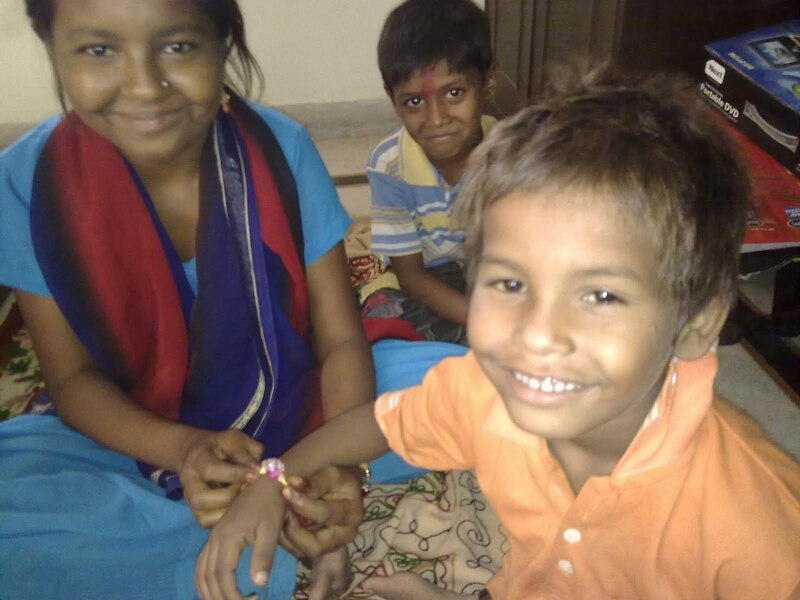 Badal, Ajay, and Mohini practiced oral exercises yesterday, learning English and Hindi nouns, like fruits, parts of the body, boy and girl, etc. Nancy, our most advanced student, practiced writing the numbers 1-10, and she also wrote the first few letters in the English alphabet. 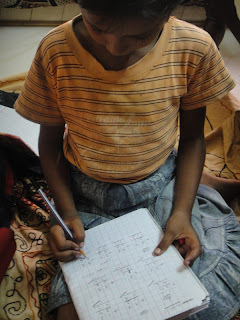 We are very proud of all of our students' progress, and we hope to be able to refine them quick enough so that we can enroll them in a school in India: Our goal is to mainstream the children into a classroom, as they are not anywhere near the level they need to be at for the time being. We will then train another batch of students similarly, so that we don't compromise the quality of our one-on-one tutoring facilities that we can currently offer our children. Birthday Party for Indian Children from Slums! Yesterday was a very special day for us here at Ek Koshish! Our volunteer from the US, Justin ji (we add "ji" after someone's name in Hindi as a a sign of respect), turned 24, and we threw him two special parties! For the first party, we invited the children from our school: The children didn't even know what a birthday is, so we tried to organize the party to be as entertaining as possible. When the children arrived, they all even had presents for the birthday boy! They brought two Cadbury chocolates and fresh flowers, which was inexplicably kind for these poverty-stricken children. We purchased a cake for the children, a bottle of pepsi, chips, cookies, two chocolates each, party hats, and noise makers, so that the children could feel that a birthday party is special! Once our students finished dancing to their heart's content, they fed the birthday boy a piece of cake, which is a common tradition in India on birthdays. Then the children started eating the birthday snacks, and they were very happy to try all of these new treats, as they had never tasted pepsi, chips, or even cake before! Finally, we treated them to another cartoon, their first Daffy Duck cartoon, before the children had to get going. 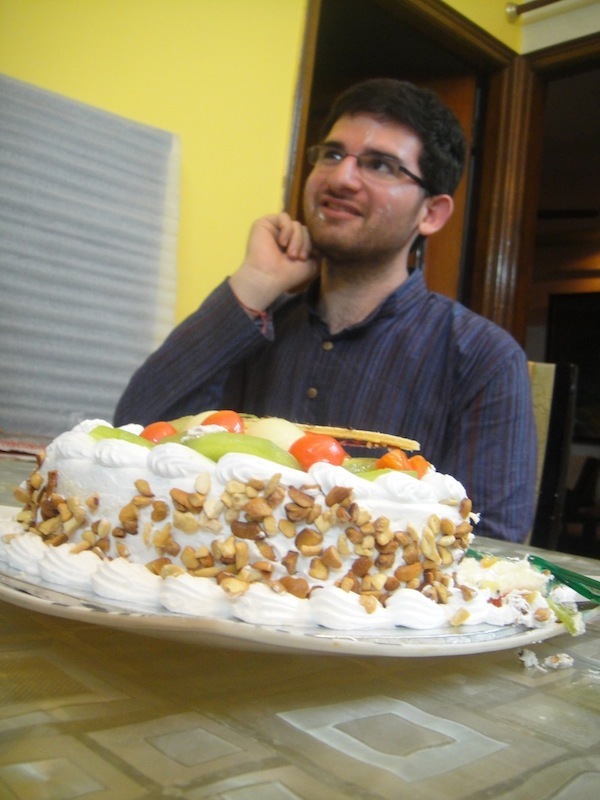 After our first party, we held a "pooja" (Hindi for an Indian prayer ceremony) at the volunteer's host family home, and afterwards, when the entire family was back from work, they arranged a special fruit cake and gifts for Justin ji. After the family each fed Justin ji a little cake, one by one, there was a mini frosting-fight too! Enjoy the photos and the short clip of our students dancing!